When Alan Stubbs lifted the Scottish Cup at Hampden on Saturday, receiving the biggest cheer of the day, he very deliberately gestured with one hand to the Hibs fans standing in the glorious Glasgow sunshine: this, he was implying, is for every single one of you. Well every single one of them, and more, many more, it seemed, came out in the Edinburgh sun yesterday to welcome the returning heroes home. Few will commend the actions of some Hibs fans who took their delirium too far after Saturday’s epic – and for once epic really does seem the right word – victory on Saturday. But these scenes in Edinburgh yesterday were completely joyous, prompting Stubbs to later remark that he wouldn’t change the experience for anything, not even promotion to the Premiership. As former Hibs skipper, and full-time fan, Ian Murray put it when we caught up on the route of the open-top bus parade, this was when the Hibee nation were able to unite as one big happy, 150,000 strong family. It was an opportunity to put Hibs’ mark back on the city, and colour it green. This was an invasion of the proper sort. But let’s not get overly po-faced. Take the emotion out of the game and you might as well hand the ball back too. It’s just a pity a broken crossbar had to stand as the symbol of a curse lifted on the front page of many papers yesterday. “Persevered” was the word written on banners draped from the top deck, as it was on tee-shirts donned by the players at Hampden on Saturday. Anyone who has ever driven through the centre of Edinburgh will appreciate the sentiment. The only slight disappointment was that it wasn’t former Hibs legend Ally ‘Benny’ Brazil at the wheel. 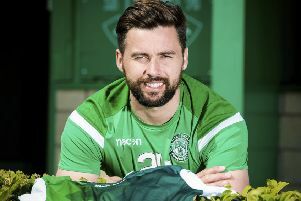 Famously, he was meant to drive the Hibs League Cup-winning team of 2004 down to Easter Road. Bur things didn’t go to plan, as used to be the case with Hibs. Poor Benny had to negotiate the roundabouts of a West Lothian new town instead. Yesterday Lindsey, a Hibs fan working for Lothian Transport, was entrusted with carting the precious cargo on a gold-coloured bus to Leith Links. This was the last stage of a journey that began when Hibs handed the cup back in 1903 with the presumable intention of seeing it again sometime soon. If, as one story goes, an unhappy gypsy placed a hex on Hibs winning it again, perhaps she included the caveat that the cup wouldn’t return until the clock on the Tron kirk steeple stopped. Well, it was stopped yesterday. Likewise, time stood still on Saturday at around 4.45pm, when David Gray stooped to head home Hibs’ winner. This particular hero looked fairly subdued as the bus headed down North Bridge, fans swarming behind it. But Jason Cummings made for a lively pied piper with his emerald green tie tied around his head, like a Hibee ninja. Chairman Rod Petrie, meanwhile, stood erect on the top deck like a stern ship captain, seemingly slightly bemused by this travelling on public transport lark. He was one of the few who looked as if he needed to throw some more liquor down his throat. Onwards the bus travelled, down Leith Street, down past the Playhouse, this institution that, while often described as venerable, was still opened a full 27 years after Hibs last won the Scottish Cup – before Saturday that is. The theatre is currently showing the musical, Annie. It’s a hard-knock life? Not if you are a Hibee. Not any more. On we strolled behind the bus, down Leith Walk. Pork pie hat-wearing Douglas Sneddon cut a dash while waiting to catch a bus going the other way. Too much emotion for one day? No, the 60-year-old explained. He was off for one more drink, one more toast. But it was the most important one of the weekend. It felt like the start of a Scottish Cup love affair – or the end of one. What do you do now you’ve finally won the trophy? “Retain it!” said one fan, aping Ally MacLeod, the former Scotland manager and, for a spell, Hibee. For the neutral, perhaps even some Hibs fans, some of the romance associated with the club has died a little. Their Sisyphean struggle is over, love’s labours ended. But of course no-one cared about this amid the insensible, overcome, victorious scenes yesterday. They couldn’t care if this cup takes another 114 years to come back. The most important part is that it came back, finally. To hang with everything, and everyone, else. Then that song, from which any line might be plucked to sum up the emotions, filled the air again. But these two felt the most appropriate yesterday: My tears are drying, my tears are drying/Thank you, thank you, thank you.